Bordering the most southern part of Chief's Island, Boro Gunns Delta Concession is situated by Moremi's game-rich seasonal floodplains and the Boro River. The concession offers a close short scenic flight from Maun. As you fly over the Delta you can see the intricate twisting and turning of the waterways and the ever-changing colors where dry land meets Delta. 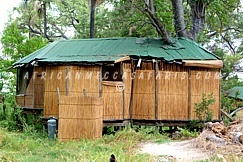 In contrast to the northern Okavango Delta where the waters are fast-flowing and the channels and view is enclosed by high reeds and papyrus, the channels around this concession offer far reaching vistas of the Moremi’s floodplain, grasslands and marginal woodlands interspersed with Mokolwane palm islands. 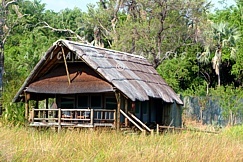 This part of the concession specialized in water based camp offering a wide variety of animal and bird species, walks close to Chief’s Island give you the opportunity to get a better view of not just the big animals but the smaller insects and birds that contribute to the Okavango’s vast ecosystem. Delta Camp offers traditional Okavango safari with your own private guide, natural accommodation, fresh vegetables, imported cheeses, excellent meats and fine wines flown in daily and lovingly prepared, maintain the camp's enviable reputation for cuisine. 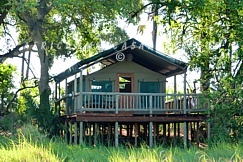 Moremi Crossing offers accommodation in 16 new-style vintage safari tents, each with its own private wooden deck and magical views over the Boro River on to Chief’s Island. 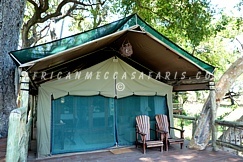 All Meru tents are large and airy with en suite bathrooms consisting of shower and toilet. 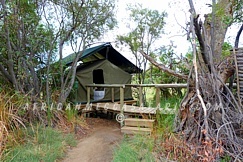 Oddballs Camp offers accommodation in dome tents set on elevated wooden decks, and shaded by shelters or trees. 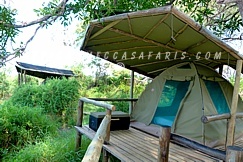 Each tent is equipped with bedding mattress on the floor, a storage trunk and a light. Beautiful outdoor showers and ablutions are en-suite.